The answer is Stratford. What is Stratford? Of course, the most well-known bit of Canadian-related trivia on Jeopardy is that its host, Alex Trebek, is one of us. One wonders then if he was somewhat responsible for the events that transpired on the game show the other night, when Jeopardy decided to test the contestants knowledge of the Great White North. Unsurprisingly, it was an epic fail. 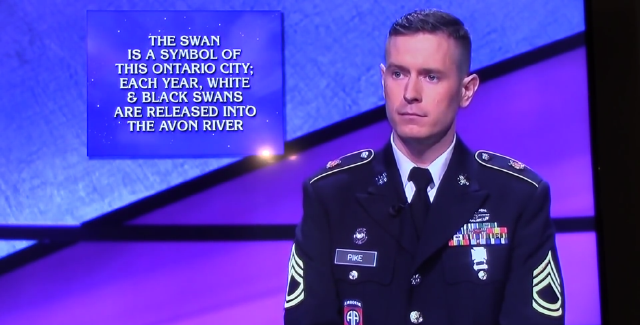 After leaving the category “Canadian Cities” to the very end of Double Jeopardy, and with time still left on the clock, the trio of players had to face the inevitable, that they didn’t know Jack about Canada. Of course, I wonder how many of the questions the average Canadian would have gotten (I got three out of five), but still, it was a truly pitiful display for a show aimed towards smart people. Let’s take a look and mock, shall we?